Esto me sirve de escarmiento por no preguntar más cosas a los vendedores y por no investigar lo suficiente. Hace algunas semanas me di a la tarea de encontrar una Fake Blythe para experimentar con los faceups, ya que no me siento agusto intentando customizar una muñeca de mas de 80 dlls sin haberlo hecho antes. Como lo han de imaginar por el titulo, no me fue muy bien. This whole experience serves me as a reminder that I should always ask stuff to sellers and to research. A few weeks ago I decided to get a Fake Blythe to practice faceups, because I don't feel comfortable customizing a 80+ dlls doll without practicing. As you may deduce from the title, this didn't go so well. Después de preguntar en varios grupos de compraventa encontré una cabeza de Basaak en un factory body. Contacte a la vendedora (muy amable) y acordamos que se la compraría en 600 pesos, luego descubrí que podía conseguirlas en 25 dolares en Taobao, pero como ya me había comprometido decidí hacer lo correcto y pagar los 600. After asking in several WTB/WTS Facebook groups I found a Basaak head on a factory body. I contacted the seller (who was really kind) and we agree that I would buy her for 600 pesos (around 50 dlls, a little bit less). Then I found out that I could get them from Taobao for around 25, but since I had already said I would buy the other doll I decide to do the correct thing and pay the 600 pesos. La muñeca en si es muy bonita, pero cuando le cambie el color de ojos me quede con la cuerda en la mano al llegar al color rosa. En esos entonces pensé que era mi culpa y que había jalado muy fuerte. Me puse a investigar y averigüe como repararla, aunque lo pospuse ya que ningún destornillador de mi casa era lo suficientemente pequeño. Entre que no tenia tiempo de ir a la ferretería y que al final termine pidiéndolos de Amazon (junto con otras cosas) apenas la semana pasada me di a la tarea de repararla. The doll is actually really cute, but when I tried to change her eye color, the eye mechanism's cord broke when it reached the pink color. Back then I thought it was my fault for pulling too hard. Anyways, I researched and found out how to repair the doll, but since I didn't have any small screwdrivers I didn't do it right away. Between that I didn't have time to go to a hardware store to get the screwdrivers and that I ended ordering them from Amazon (among other things), I repaired her until last week. Todo funcionaba muy bien... hasta que llegue al color rosa y se volvió a atascar. Resulta que el mecanismo de los ojos esta defectuoso y cuando llega al rosa se atora, por lo que al jalar el cordon termina saliendose. En pocas palabras, mi mona esta defectuosa pague relativamente de más por ella. Everything was alright... until I reached the pink color again and the mechanism got stuck again. The eye mechanism is defective, and that's why it gets stuck on pink, and when you pull the cord ends up getting out of it. 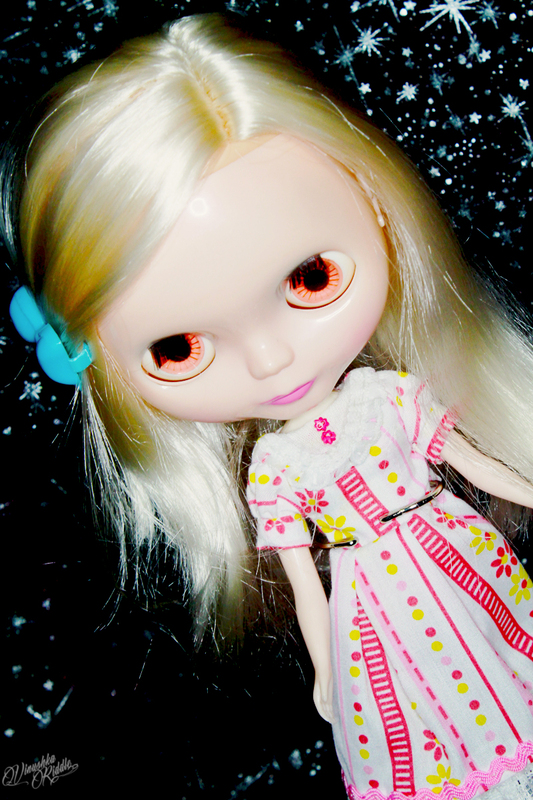 In few words, my doll is defective and I paid relatively more for her than what she's worth. Al final de cuentas pretendo usarla para practicar, tal vez le quite el mecanismo y le ponga ojos de cristal. No lo se, la cuestión es que me siento un tanto amargada respecto a esa muñeca, ya que al final de cuentas todo esto fue mi culpa por no investigar y por no hacerle más preguntas a la vendedora. Tampoco la contacte, por que cuando me di cuenta de que estaba defectuosa ya había pasado demasiado tiempo de haberla comprado. 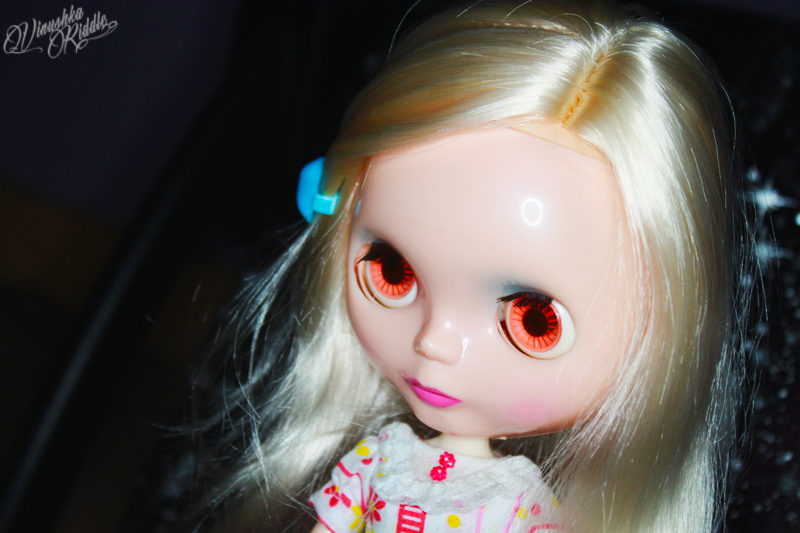 Anyways, I will use her to practice my faceups, maybe I will take out the mechanism and put some glass eyes on her. I don't know, I mean, I feel a little bit bitter about that doll, because in the end it was my fault because I didn't researchy and for not asking more questions to the seller. I didn't contact the seller because when I found out the doll was defective, a lot of time had passed since I bought her. En otros temas, ¡el próximo mes me voy a ver a Dir en Grey a Los Angeles! Sera toda una aventura ya que sera la primera vez que viaje en autobús con amigos. Ya me había ido de roadtrip con mis amigos, pero siempre íbamos en carro. De verdad estoy muy emocionada por el concierto, ya que tenemos boletos V.I.P, no solo voy a entrar antes y me van a dar mercancía especial, si no que también los conoceré en un meet & greet. Esperen un reporte del concierto, muchas fotos y posiblemente un giveaway con algún recuerdo del concierto. On other news, next month I'm going to see Dir en Grey in Los Angeles! It will be an adventure because it's the first time I'm travelling on bus with my friends. I had already went on a roadtrip with them, but we always went on car. I'm really excited about the concert, because we have V.I.P. tickets, besides getting into the venue early and getting special merchandise, we will actually meet them on an special event. Expect for the concert report, lots of photos and maybe a giveaway of concert merchandise. Estoy visitando tu blog por primera vez, saludos! Yo suelo tenerlas en estantes bastante altos xox por eso de los animales y gente metiche.